Soak the dried porcini mushrooms in a bowl of hot water for approx. 20 min., then drain, reserving the liquid. Cut fresh porcini mushrooms into bite-sized pieces. Finely chop onion and mince garlic. Melt butter in a large pot set over medium heat and sauté onion and garlic for approx. 3 min. Add all of the mushrooms to the pot, and sauté for 2 – 3 min. Add risotto rice and sauté until slightly translucent, approx. 2 – 3 min. Add white wine, mushroom soaking liquid, and let cook until evaporated, stirring constantly. Season with salt and pepper to taste. Gradually add water by the half cup, stirring constantly and only adding more water once the previous addition has been absorbed. 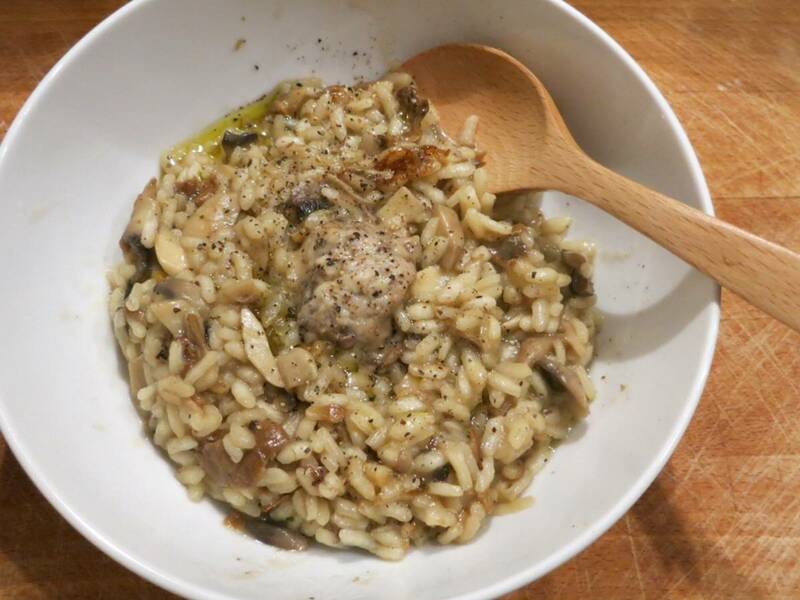 Once the rice is cooked through and the water has been used up, serve the risotto. Garnish with lots of Parmesan cheese and a light drizzle of truffle oil, if desired. Enjoy!